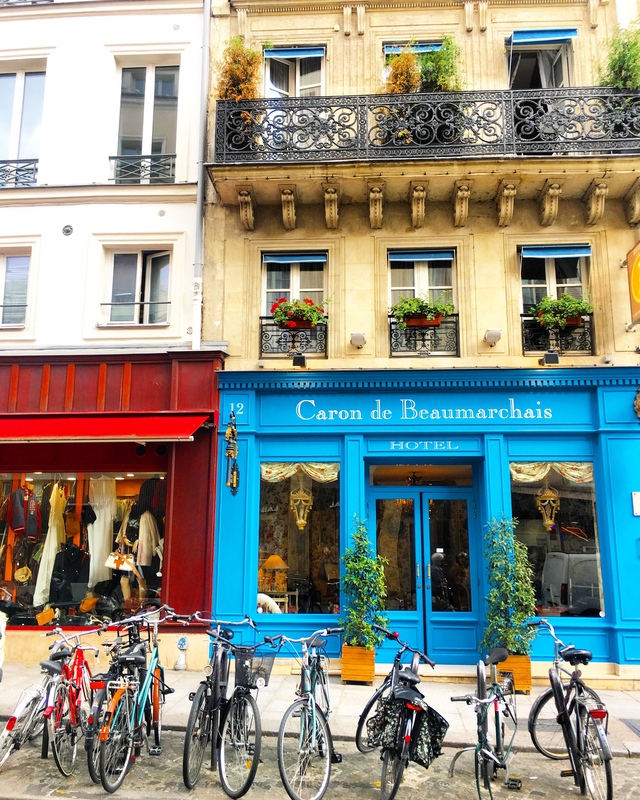 Paris is not short of impeccable 5 star hotels that epitomise luxurious French style, however if you are looking for something a little different at a fraction of the price, look no further than the very quaint Hotel Caron de Beaumarchais. Located in the historic Le Marais district, one of our favourite areas of Paris, this cozy boutique hotel feels more like a stay in a chic Parisienne home than a hotel. The 18th century residence is a step back in time with silk wallpaper, 1700’s piano-forte and exquisite chandelier in the lobby, and small hallways and staircases that give you a great sense of how homes in Paris would have been hundreds of years ago. Beaumarchais, the famous French playwright, lived just a few doors away and is the inspiration for the hotel name and decor which is packed with antiques and period charm. The service is wonderfully friendly and personal (the staff also speak excellent English) and the location is perfect for exploring the historic Le Marais district and enjoying its wonderful shops, bars and restaurants. Most of the 19 hotel rooms are really only suitable for a couple or one person travelling alone as they are very small even by Parisienne standards, however what the hotel lacks in size it makes up for in ambience and atmosphere. We were pleasantly surprised by the Annick Goutal toiletries in the bathrooms, the comfortable beds and the quality of the coffee. The rooms facing the road are the largest and some have small balconies, making them slightly more expensive but worth it for the extra space. The Hotel Caron de Beaumarchais is the perfect mix of affordability and an authentic Parisienne experience in the French capital. Charming…Thank you for sharing. Paris is on my Travel Bucket list. Oh my goodness that looks soooo sweet! I would love to go to that hotel, gorgeous. Thanks for sharing. We know the hotel, it’s charming. However, we find French hotel rooms to be too small to work in and therefore much prefer to stay in an apartment. That way we can also eat out and eat in from all those fabulous traiteurs and markets. I love your blog. Thanks for showing me all the places I’ll probably never get a chance to see with my own eyes. Love the Marais. We stayed at Les Tournelles in 2017. Great service, ambiance and location. We did not have enough time to do much exploring in the Marais, so will have to come back. It’s such a wonderful area to explore! Oh my goodness, I love it! It’s true French style. And I love the Marais, I was just there in 2017. Thanks for the post and hotel tip! Cheers.